I took a few days off from working on my rewrite to regain focus on what I am trying to do and accomplish. When I first started this novel, I had an idea and I worked with it, but in the end after writing over 70 thousand words, I found that I wrote a lot, but the substance that I thought I had wasn’t there. It’s one of the reasons i’m changing so many things. The idea is still there and that is super important to me, because I don’t want to lose my original idea. The reason I fell in love with the story so that I could write the story. There are many things that I do to help me work through a block or a scene that refuses to be written. I’m a creative person and that creativity comes through several mediums. One of them is crotchet and another is beading. I love working with my hands and both of these hobbies allow me to do that without having to use a lot of brainpower. That means as my hands create something, my mind can work on a problem. I can visualize or even run through a conversation over and over until I can see it or hear it in the context that I was trying to achieve in the first place. The pool is also a great place to think. There is something to be said about swimming especially underwater. After all of these things, including switching from the keyboard to a pen and paper, I have worked though several plot points that has been giving me a difficult time. A break along with other creative distractions have led me to working within the goals of all my major players. I really needed to get into the head of my villain (antagonist) and understanding her needs and desires, I feel that I can play her off my hero (protagonist). Throw in a little romance and lots of obstacles and I have a promising rewrite. And of course, coffee goes hand in hand my writing. 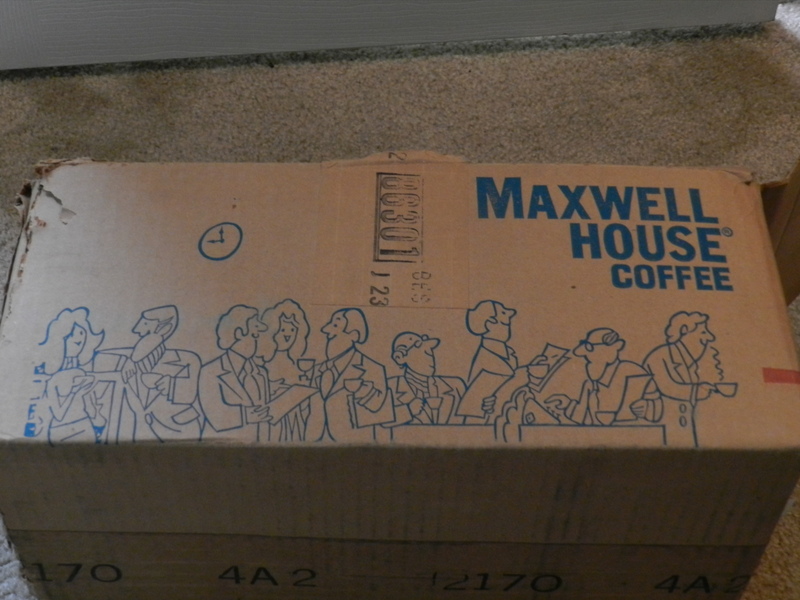 This is a really old box that I took a picture of that I thought was funny. Now it’s time for me to return to my rewrite with my cup of coffee. Have a wonderful week! !